Disability News Service comments on Mind CEO response to event organised on 31 October, to protest against Mind's involvement with the DWP. Open Democracy piece by Peter Beresford 'Work makes you well? After austerity comes complexity' - This week the government announced new health and welfare plans to ‘help’ (or bully?) disabled and sick people. Why are the disability charities so quiet? 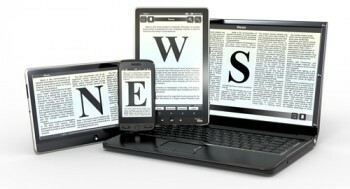 Trending: discussions around mental health and privacy, following the Lancet Psychiatry having made the case about using social media posts for research purposes. Brighton and Hove Independent report on a football tournament raising awareness of mental health. The survey is designed to gather your views on the principles of the Mental Health Act and how people’s rights are currently protected, where this is working well and what could be changed and improved. 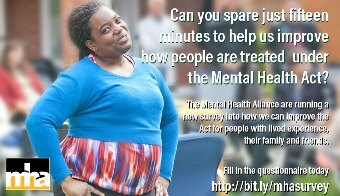 If you have experience of the Mental Health Act, this is your chance to be heard. Whether you have experience of mental illness, are a family member, carer or loved one, or a mental health professional, we’d love to hear from you. 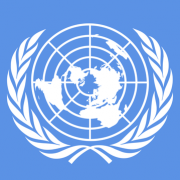 Disability rights UK (DR UK) called for evidence, between September and October 2016, on the UK’s performance under the United Nations Convention on the Rights of Persons with Disabilities (UNCRPD). DR UK have focused on England, whilst Disability Wales and Inclusion Scotland have done similar work in Wales and Scotland. What are the priority issues that you believe should be included in our report to the UN Committee on the Rights of Persons with Disabilities? Why do you consider these to be priorities and what evidence can you provide to show that there is or could be an adverse impact on the rights of persons with disabilities? Do you hear voices and self harm? could you help with this research? The aim of the CHAMPS study is to check what most peer supporters believe to be important and helpful / unhelpful to them in carrying out the role. The CHAMPS study aims to explore if there are relationships between experiences of providing peer support and the wellbeing of peer supporters. They would like views from as many UK peer supporters as possible. The results will be shared with participants and with the peer support community as early as possible. Eligibility criteria: Please read the following bullet points. If you can agree with ALL of them, then you are eligible to take part. "I have had personal experience of a mental health problem"
"I currently provide, or have provided in the past 5 years, support to another person with a mental health problem to assist them in their recovery"
"The above support is / was provided as part of a formal role within an organisation* such as a voluntary / charitable organisation, or a statutory service"
"The above support is / was provided in the UK"
You can find out more and how to participate here. focused around wellbeing and what makes you feel better – enjoy creating! There are more than 6,000 suicides in the UK each year. Suicide is the biggest killer of men under 50, and the biggest killer of young people aged 20-34. 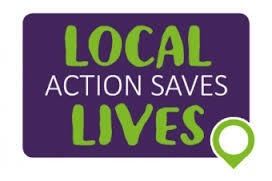 Local Action Saves Lives is Samaritans’ campaign for all councils to put in place effective suicide prevention plans. Because without a proper plan involving local organisations, suicide prevention work is much less effective than it could be. Bristol based Self Injury Self Harm (SISH) invite you to this creative workshop, which is open to all, no previous artistic experience needed. This practical and “hands on” workshop will lead you through some ways to use various art materials to explore this in a safe, held and non-judgemental space. Bristol Mind has an accessible ground floor, but workshops are held on the first floor, which is not wheelchair accessible. Bristol Mind has a hearing loop in place. Cost: £5 waged / £3 unwaged. You can turn up on the day, no booking required. It is estimated that around 850,000 people in the UK are living with dementia and that a further 700,000 are providing care and support to people with the condition. 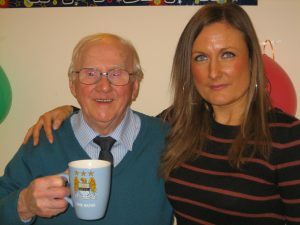 Healthwatch Hartlepool has published its own investigation into Patients Experiences of Dementia Diagnosis in Hartlepool. 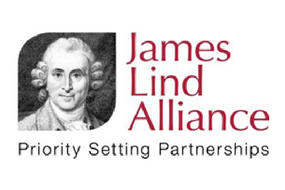 The James Lind Alliance and Bipolar Priority Setting Partnership (PSP) have worked alongside Bipolar UK since September 2014. An initial national survey gathered nearly 14,500 questions from people who live with bipolar, families and health professionals. After these were longlisted to 71 questions, another survey resulted in the top 35 potential research questions. Anxiety UK have announced the passing of founder Harold Fisher who died peacefully on Thursday 27 October 2016. Mr Fisher's funeral will take place on Tuesday the 8 November 2016 at 10.20 am at Peel Green Crematorium. Due to a new 5 year contract Carers Trust Heart of England Crossroads Services are looking for a committed Care Coordinator to join a busy team at Carers Trust's Rugby office. 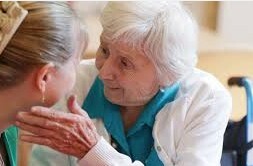 Prior experience as a Coordinator in a care environment is desirable. The successful candidate will need to have a license and their own transport and be computer literate with the ability to work in a fast paced environment and able to prioritise their work. Excellent communication skills are essential along with the availability to work regularly out of normal office hours to cover ‘on call’ duties. The salary is £16,084 pro rata + on call payments working 20 hours per week with a possibility of the position becoming full time. 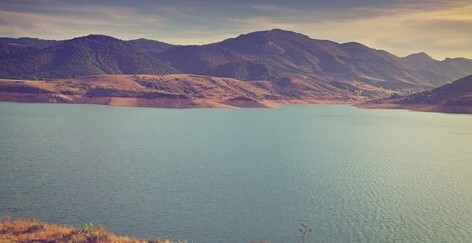 Bipolar research: which outcomes matter to you? Open Dialogue UK is delighted to welcome Steven Morgan to the UK to run a one day introduction to Intentional Peer Support on 16th November 2016 in Dalston. Intentional Peer Support is a powerful framework for thinking about and creating transformative relationships. Practitioners learn to use relationships to see things from new angles, develop greater awareness of personal and relational patterns, and support and challenge each other in trying new things. IPS is used across the world in community, peer support, and human services settings. We come from a history of grassroots alternatives with a focus on cultivating relationships that are mutual, explorative, and conscious of power. The one-day IPS Overview is a highly interactive exploration of the three principles and four tasks of IPS. Here participants learn the basic framework for reflecting upon and developing mutuality in their work environments and relationships. We will also discuss how IPS is currently being used in peer-run projects, hospitals, approaches to first-break psychosis, and other innovative areas. Cost: The event is run on a donation basis, to cover the costs of running the day. We expect this event to fill up quite quickly, so recommend booking early. A new, lower cap on the total amount of benefits a household can receive has come into force in a move the government says "restores fairness", but campaigners warn it will push more people into poverty. (Guardian comment here). The annual cap was £26,000, but the government has slashed it further to save money from the welfare budget and try to encourage more people into work. It is now £23,000 in London and £20,000 outside, to acknowledge the substantial difference in the capital's cost of living. The cap includes payments such as housing benefit and job seeker's allowance. Read more here. The DWP is seeking views on how to transform employment prospects for disabled people and people with long-term health conditions. This consultation closes on 17 February 2017. The consultation is accompanied by a series of green papers and booklets. To read the materials and take part please visit this page. The DoH has published this policy paper on 20 October and updated it on 4 November.